A visit to the Maybelline New York Mascara Bar can make life a whole lot easier if you're not sure what to use on your lashes. If the myriad formulas have you scratching your head in confusion, this rundown on all things mascara should help. Maybe She's Born With It. Maybe It's Maybelline. For some of us, that jingle is as familiar as our home address. Cosmetic brand Maybelline's catchy tag line is more than just a witty phrase, though - it's also the company's credo when it comes to creating cosmetics that instill confidence in women. A flush of blush, a slick of gloss and a coat of mascara is a great example of the basic, quintessential Maybelline look. Though the Maybelline lineup is vast and the company's history quite lengthy, it's the mascara that really stands out. This is due greatly in part to the cult popularity of Great Lash Mascara. The famous pink and green packaging is a throwback to a different era, making it stand out in a sea of slim, somber black tubes. It's not just the vibrant color palette that makes it a standout, though. This Hollywood favorite is touted by the company as America's number one mascara; in fact, one tube is sold every 1.9 seconds! Just like the original version, the follow-up waterproof variety was also an instant success. There's more to the collection than just Great Lash, though. Maybelline also offers 12 other varieties. It's heaven for the avid mascara enthusiast, but it can spell mass confusion for the woman who isn't quite sure why she would even need so many options. It's just mascara, right? 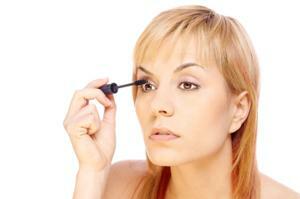 No, it's not just mascara, as the history of makeup has so ably proven. New mascara formulas are introduced all the time. Each brags that it can make those little lashes extra-voluminous, transform those straight hairs into star-worthy curls and give new life to dull eyes. In other words, as long as new mascaras keep hitting the shelves and promising us the world, we'll keep buying. That's where the Maybelline New York Mascara Bar comes in. While you might be envisioning a gleaming counter lined up with a pleasing yet confusing array of mascaras, you're in for something completely different at the bar. The "bar" is actually a mobile mascara tour across the country. Ideal for the woman looking to dip her feet into the vast world of Maybelline mascaras, the bar is the place to be for the lowdown on all things eyelash-enhancing. Held over the course of two or three days in various cities across the country, the bar is the brainchild of Maybelline makeup artist Chuck Hezekiah. Events designed to help a woman look and feel her best are nothing new to Hezekiah. He's also helmed other events for brands such as Garnier Nutritioniste, offering one-on-one skin consultations to participants. A favorite among the celebrity set, Hezekiah has even made an appearance on SoapNet's I Wanna Be a Soapstar and offered contestants advice on how to look their most dazzling. With a résumé like that, there's no doubting Hezekiah's abilities to bring out the best in a woman. The mobile bar setup is perhaps slightly less than glamorous, though. Reminiscent of a fireworks stall, the bar features large cardboard cutouts of Great Lash mascara, dangling blue pendant lights and plenty of free miniature tubes of Great Lash. A row of stools lines the bar's front, where guests are invited to sit and receive an eye makeup makeover, complete with product recommendations. In addition to free mascara, guests also receive a coupon and an educational booklet called "My Color Advisor." Of course, the allure of freebies is only so great; a little celebrity presence is always a bigger draw. Though no big names made it to the events, Hollywood lifestyle expert Phillip Bloch made an appearance at the Los Angeles stop and offered his tips on how to achieve a model-worthy look. The bar toured the country for several weeks in 2007 before wrapping up in the fall. Though no new tour dates have been scheduled, keep an eye on Maybelline's Web site for any changes. In the meantime, read up on How to Apply Eye Makeup.